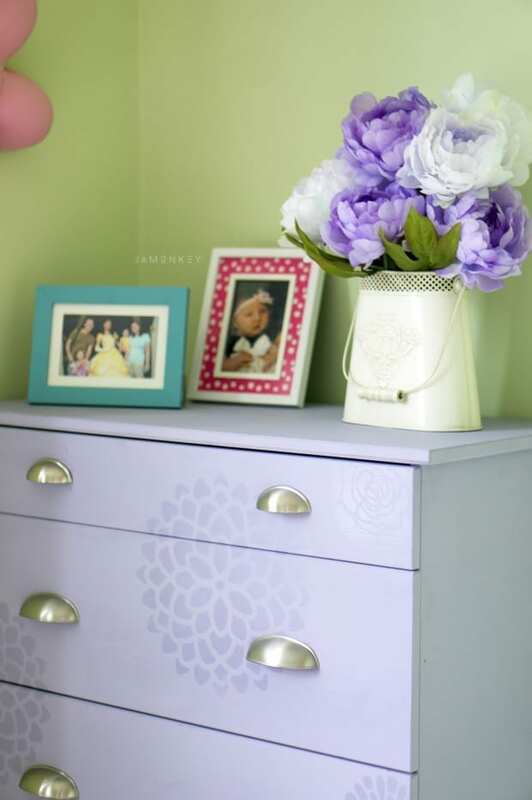 In this post I transformed an IKEA Tarva dresser into a floral dresser for a little girl's room. Using different types of paint to create the subtle appearance of flowers. We recently bought two new dressers to put into the girls' rooms because they need more room for their expanding wardrobes. By “expanding,” I mean their clothes are getting bigger and longer from them growing up. The first dresser we decided to do was my oldest. 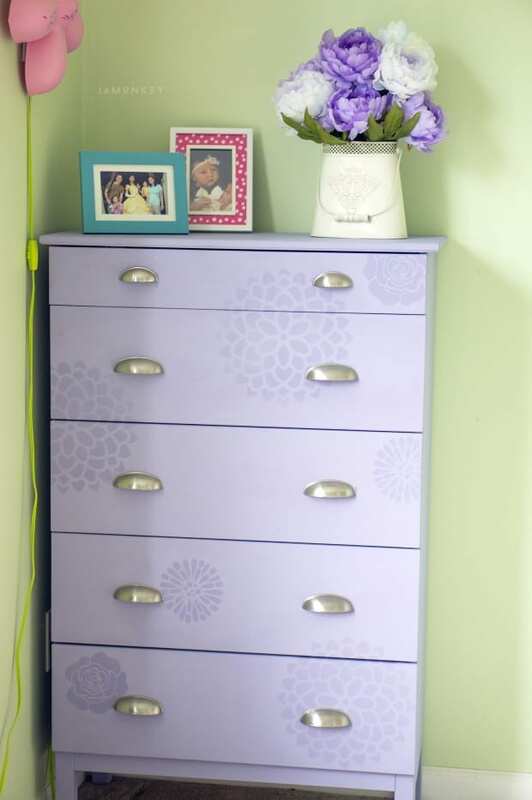 Her special request was for a purple dresser with pink handles. Luckily, I’m participating in Ace Hardware’s Color of the Day to help launch the 31 Days of Color. My color is the beautiful Silver Rose, which is a beautiful purple color. So we picked up the paint from Ace Hardware, which was great because the gentleman at the paint desk was so helpful and kind. I love going to my local store because of this. There is always a friendly face asking me if I need help. Nickle Handle Pulls – The top drawers have smaller 2 1/2″ pulls. I then took my daughter to help me pick out stencils and some new things to add to her room to complete the makeover of the boring dresser we bought. We got an unfinished design and didn’t install the handles. We picked out new metal handles instead to make it look more grown up. We started by priming the dresser to make sure that you couldn’t see the pine under the paint. The paint has primer in it also, but I wanted to make sure it was a thick purple layer. After the primer, I gave the dresser two coats of Silver Rose. The Silver Rose is a flat matte color because the designs we plan to use on it will be done in an ultra clear gloss. 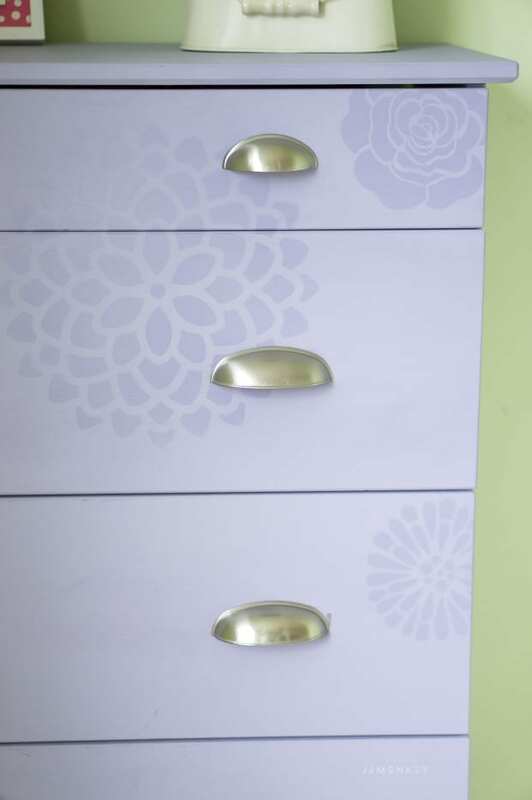 After it was completely dried, I used the stencils in random places on the front of the drawers to spray the ultra clear gloss. This caused the stencil designs to really pop on the dresser. We then added the new drawer pulls to finish the beautiful dresser. Despite not having pink handles, my daughter loves it! We picked out a cute metal tin and some silk peonies to go in her room too. We had quite the bonding experience picking everything out. It fits beautifully in her pastel-colored room. Check out my Library Card Catalog Dresser also. This is so cute! I love the subtle stencil work! This is so cute! Love the stenciling!